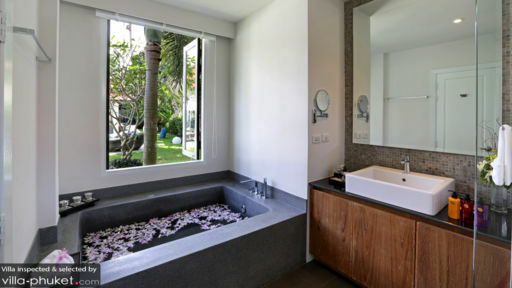 Enjoy the best of Phuket from Villa O, a four bedroom villa located in Bangtao. You’re set within easy reach to myriad attractions - from trendy beachfront dining establishments, to quaint antique shops and an adventure mini golf club. After a day spent exploring the best sights on the island, you’ll be yearning a quiet evening spent staying in - and you’ll find the finely appointed and well-equipped living spaces at Villo O just perfect for rest and relaxation. Villa O accommodates a maximum of 10 guests in four bedrooms. And just like the common spaces, the vibes in the bedrooms are relaxed and inviting. Neutral hues like white and gray are featured within, and the elegant decor is complete with wooden furnishings and simple home ornaments. Private en suites and air conditioners are amenities common to all bedrooms. The master bedroom is furnished with a king bed, two of the guest rooms are equipped with queen beds, and the fourth room is fitted with twin singles. Behold the beautifully landscaped outdoor compound at Villa O! The grounds come complete with a swimming pool, recliners, patio umbrellas, daybed and outdoor sala. A dining set overlooking the pool provides a comfortable setting for al fresco feasting. Towering palms and trees dot across the neatly manicured lawn, and abundant tropical foliage frame the garden to create a picture-perfect setting ideal for outdoor relaxation. Bright and airy, the living spaces at Villa O feature an open plan layout, simple colour scheme and tasteful wooden furnishings. The various common areas merge together seamlessly in an open plan layout; a cosy living area extends out to include a dining suite and fully equipped kitchen with breakfast bar counter. White and gray hues dominate the colour scheme, with artworks and ornaments in eye-catching colours enlivening the interiors. During your stay at Villa O, you do not have to worry about a thing because the staff will be there for you. You’re just a five-minute ride away from Bangtao Beach! And even if you’re not in the mood for hitting the coasts, there’s plenty else to see and do in the area. 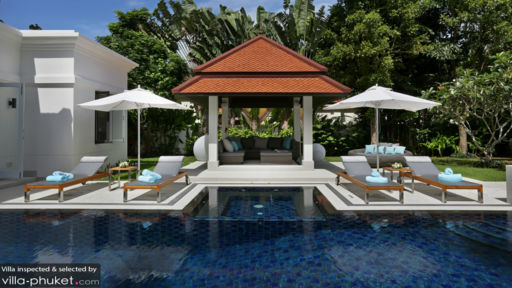 Head to a trendy venue like Xana Beach Club for a leisurely brunch, indulge in luxurious massage treatments at the Banyan Tree Spa Phuket or round up your travelling party for a game at the Phuket Adventure Mini Golf. Watersports enthusiasts will enjoy a day of wet and wild fun at the Anthem Wake Park. Everything about this place is amazing. From the hostess to servers, and of course the food. There brunch items are unique and delicious. They have awesome mimosas, and they are bottomless. They have healthy options for the health conscious. The environment is trendy and lively. We really enjoyed our meal at Villa-O. We enjoyed a table on the patio with little street noise. There were options for our whole family which includes a meat eater, fish eater, and pasta/pizza eater. The scallops were excellent, pasta and sauces all superb. Service was appropriately paced and our server was attentive without being obsequious. Great neighborhood restaurant! Celebrated Mother's Day at Villa O, the service was great and the food excellent. They serve brunch on Sundays and have a very good selection. My husband had the Italian egg Benedict, they were delicious and i had eggplant parmigiana, the sauce was very delicate and flavorful! The outside seating is really beautiful. On Sundays kids under 15 eat free. Highly recommend it. I had my four year old with us and they had crayons and a coloring menu, so no problem, however, I would recommend to go there sans kids.